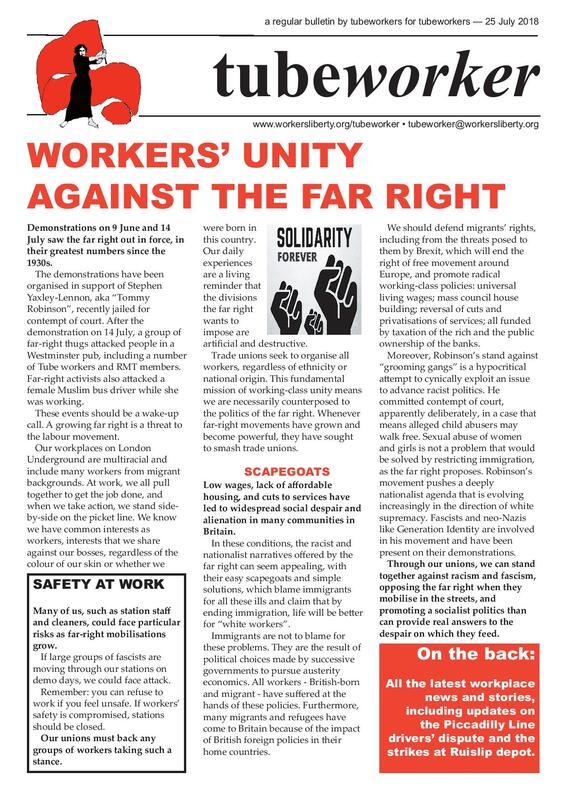 Tubeworker — 31/08/2017: Fight The Fascists! Tubeworker 06/07/12 - Support the Spanish miners' strike! Tubeworker 30/05/12 - Defend workplace conditions! Tubeworker 23/04/12 - Support the TubeLines strike! 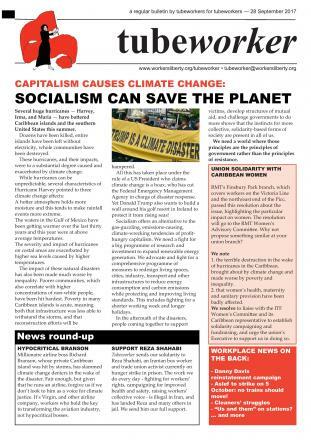 Tubeworker 05/03/12 - Still time to stop NHS sell-off! Tubeworker 30/01/12 - Thatcher: why hate her? Tubeworker 04/01/12 - Happy New Year! Tubeworker 29/11/11: "Leaked Document" - we can defeat it! 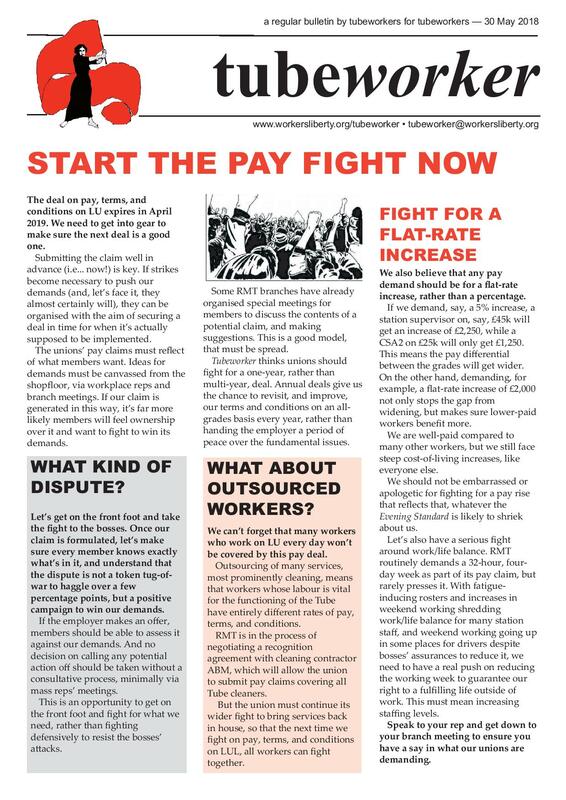 Tubeworker 10/10/11: Special issue - Vote to REJECT Tube pay offer! Tubeworker 23/7/11: Take the Media from Murdoch! Tubeworker 25/5/11: Defend Our Right to Strike! Tubeworker 21/4/11: Reinstate Our Reps! Tubeworker 20/3/11: Fight the Cuts! Tubeworker 12/2/11: Solidarity with Egyptian Workers! Tubeworker 19/12/10 - Defend Your Union - Stop These Sackings! Tubeworker election special - Vote Janine Booth! Tubeworker 15/10/10: RMT Executive - Vote Janine Booth! Tubeworker 1/10/10: Keep Up the Fight for Jobs! Tubeworker 17/9/10 - Solid Strike: Now Keep Up the Fight! Tubeworker 3/9/10 - All Out to Stop Job Cuts! Tubeworker 20/8/10: 'Yes' vote - It's time to fight! Tubeworker 19/6/10: All Out for the Tube Lines Strike! Tubeworker 18/4/10: Keep the Tories Out! Tubeworker 15/11/09 - ASLEF: Vote No! Tubeworker 21/9/09 - Stop Public Service Cuts! Tubeworker 21/7/09: Stop the BNP! Tubeworker strike special 9/06/09: the fight is on! Tubeworker 20/4/09: Know Our Strength - And Use It! Tubeworker 2/3/09: Fight This Pay Insult! Tubeworker 11/2/09: Unions Must Fight Job Cuts! Tubeworker 17/11/08: We Need A Workers' Plan! Tubeworker 28/10/08: Vote Steve Hedley! Tubeworker 30/5/08: Stop The BNP! Tubeworker 9/5/08: Pay - The Fight Starts Now! Tubeworker 18/4/08: Mayor election - Who speaks for us? Tubeworker 17/2/08: Vote For Action! Tubeworker 12/1/08: It's Time To Fight! Tubeworker 21/12/07: Ready To Fight! All Out for a Better Deal! RMT pay strike ballot: Vote YES! Tubeworker 27 February 2004: We need a political voice! Tubeworker 26 November 2003: Equality Now! Strike to save Chris Barrett's job! 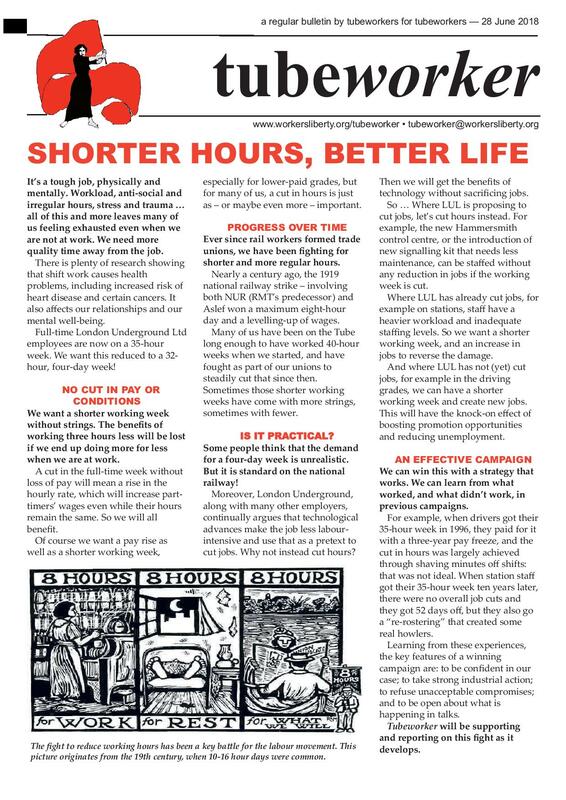 The latest edition of the printed version of Tubeworker, a socialist industrial bulletin for London Underground workers, by London Underground workers.